Sedona is one Arizona location that I love for its scenery, but tend to avoid because of the crowds. This area is commonly considered to be a second most popular tourist destination in the state, after the Grand Canyon, and it shows. Stereotypical Arizona curio shops, high hotel prices, and traffic jams are characteristic of the city, and for some Arizona locals it is a picture of the caricature that tourism can morph a community into. That being said the culture of Sedona is unique and alluring, and the scenery is spellbinding, so, once in a while, I can’t resist braving the crowds and giving the area another visit. 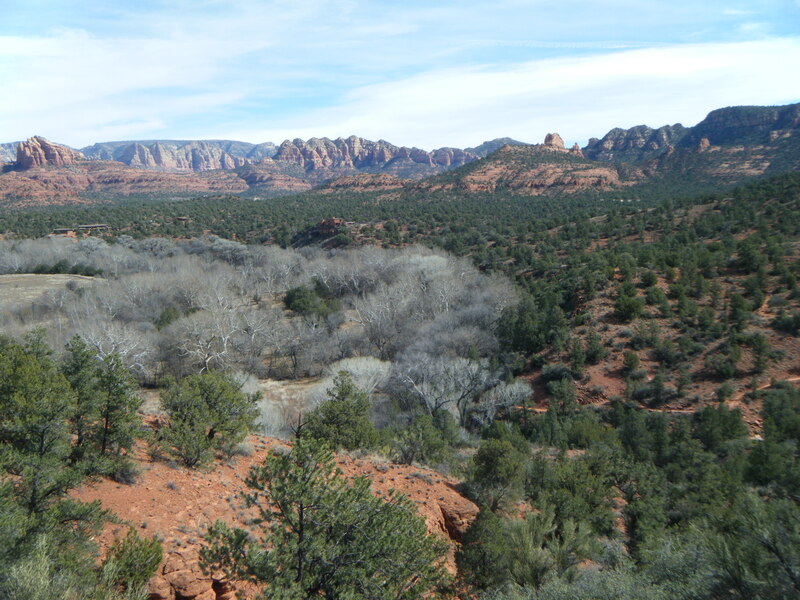 This year, I wanted to go for a Valentine’s Day trip, because Sedona is very conducive to a romantic adventure. There are plenty of vistas that lend themselves to great couple’s pictures, a variety of trails to explore and experience together, as well restaurants and luxury resorts to enjoy. 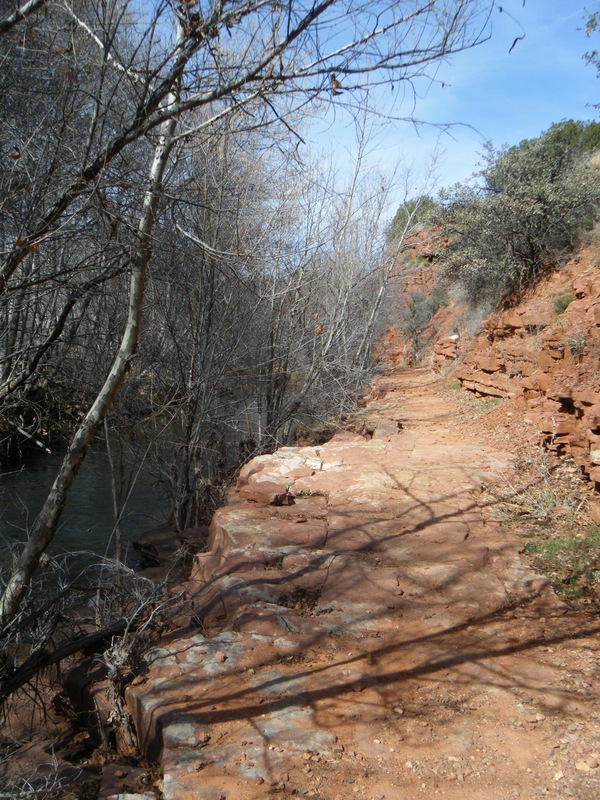 These things also make Sedona particularly busy on Valentine’s Day weekend. In planning our trip, I began to get a little worried when I noticed that not only were hotel prices higher than usual, but most places were full. The traffic from Phoenix to Sedona was unusually heavy as well, most likely due to the combination of Valentine’s Day and the three-day weekend. The point of all this, is to say that I after convincing my boyfriend that a trip to Sedona was a good idea, I got more and more worried as the day approached that the town would be so crowded that we wouldn’t be able to have a good time. As it was, our first stop solved much of this problem for us, as it provided many of the views that we were hoping for, including hikes along Oak Creek, without the crowds that tend to gather in areas closer to the city. The Red Rock State Park, dedicated and opened to the public on October 19, 1991, is a fairly recent addition to the list of Arizona State Parks. It is situated on the former location of Smoke Trail Ranch, and surrounds a stretch of Oak Creek. In fact, the park was first imagined when Governor Babbitt was hiking down Oak Creek in 1980. He was approached by the owner of the Smoke Trail Ranch, who informed him that he and his party were on private property and would have to leave. Property along Oak Creek was being snatched up quickly at this time, and it became apparent to Babbitt that unless something was done, the Creek would no longer be open for public use. Negotiations began between the state, the Anamax Mining Company, and Eckankar, a alternative religious group that was developing the land for a religious retreat, and which had turned Babbitt and his group away from the Creek. This process took nearly a decade, and I can say that all of Babbitt’s work is much appreciated. Currently, the 286 acre state park contains a visitor center, environmental education center, and 10 developed trails of varying lengths and difficulty. When my boyfriend and I arrived at the park, we briefly explored the visitor center, which contains the environmental education center, and a gift shop that supplied a variety of books and souvenirs for Arizona and the Sedona area. After that, we walked out onto the broad plain that stretches out from the visitor center and then down to the line of trees surround Oak Creek. 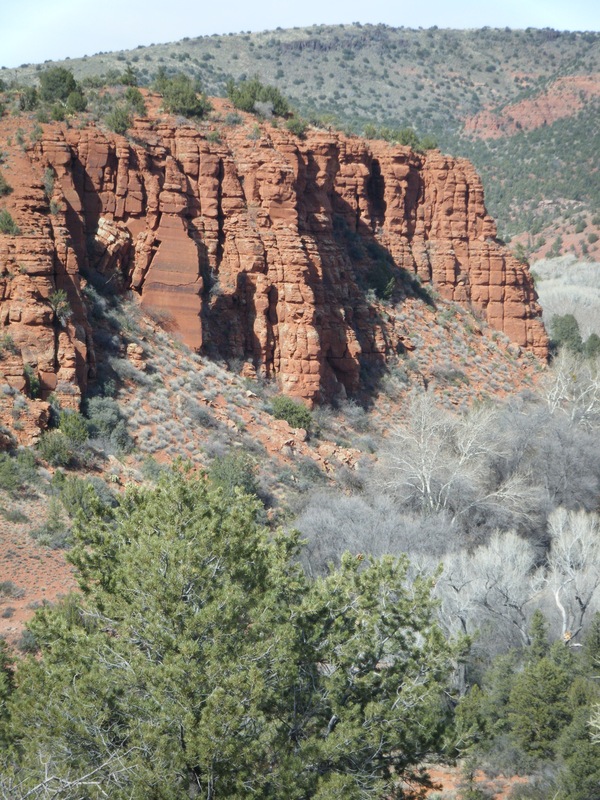 From here, the red rock formations that surround Sedona were apparent, but the best views of the mountains were to come. We headed down Smoke Trail, which meanders along the clear, gurgling waters of Oak Creek, to Black Hawk Crossing. 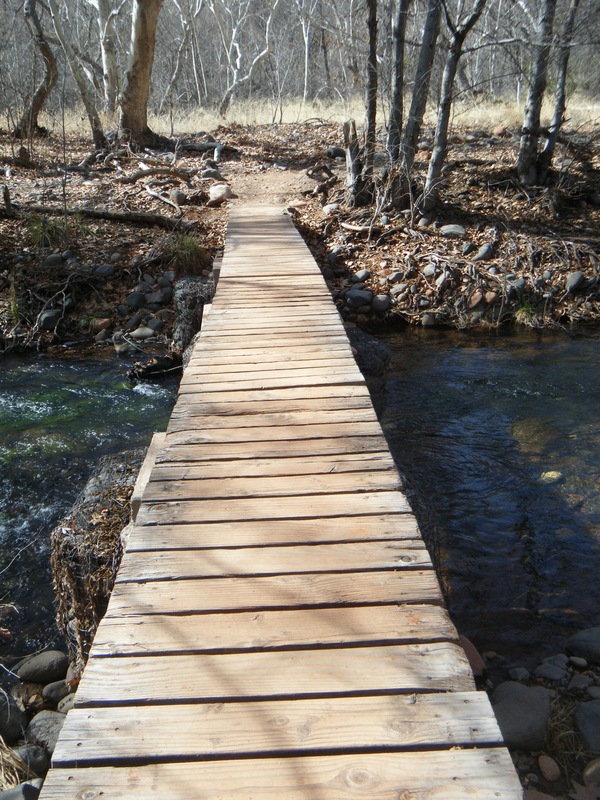 Here the trail crossed the creek via two narrow, wooden bridges. I stopped on each to get a good look down the corridor of trees that lined either side of Oak Creek. The water was clear, and the creek bed was lined with rich green, water grasses that swayed and waved down stream from their roots. If we had had supplies for a picnic, this would have been a wonderful spot. After crossing the creek, we climbed Eagle’s Nest Trail to the top of the red butte that dominates the western portion of the park. From this vantage point, I snapped off pictures of the valley that contains the state park. With a backdrop of the majestic, striped formations of Sedona, Oak Creek twists through the valley, hedged by trees that stand out starkly amid the desert landscape. We continued our exploration, taking the Coyote Ridge Trail to the House of Apache Fire. Fenced off and protected from the potentially destructive feet of explorers, the House of Apache Fire was built by Helen Frye, who was one of the early owners of the Smoke Trail Ranch, and was responsible for handing the land to Eckankar. It looked to be a sad reflection of what it once was- a red walled building that seemed the sag beneath the weight of the sky. My boyfriend and I couldn’t help but wonder about the park’s future plans for the building. Finally, we crossed Oak Creek again and returned to the visitor center. The views, the trails, and access to Oak Creek were all major attractions in this park, and for anyone looking for a quieter area to experience and explore Sedona, I would highly suggest visiting Red Rock. Sounds very tasty! I would love to have a recipe. 🙂 Thank you for the kind offer. Hiker’s Honey Fruit Squares – 2 eggs, 3/4 cup honey, 1/2 cup all purpose flour, 1/2 cup graham cracker crumbs, 1 cup dried fruit (currants, dates or prunes), 1/2 cup nuts-chopped: Preheat oven to 350. Grease and flour an 8-inch square baking pan. Beat eggs in a medium mixing bowl until very light. Add honey in a very fine stream to eggs beating constantly. Stir in flour and graham cracker crumbs. Add fruit and nuts; mix well. Spread the batter into the baking pan. Bake for 30 to 40 minutes or until firm in center and brown on top. Cool and cut into squares.